Learn how to make your own makeup brush cleaner at home with our DIY recipe and step-by-step guide. After all of the parties and get-togethers over winter break, I’ve arrived back at school with a bunch of dirty makeup brushes. So, for this week’s post, I decided it would be both necessary (for me) and useful (hopefully, for you) to share an inexpensive yet effective way to easily clean your makeup brushes! Now, let me start by debunking a myth: Most people think that you need to buy an expensive brush cleanser from Mac, Sephora, or Ulta to get your brushes really clean, but honestly, if you have olive oil and dish soap, you can clean your brushes just as well. Now, you may be wondering, “um, why would I ever put dish soap and olive oil onto a makeup brush?“ Well, the dish soap cleans and disinfects your brush, while the olive oil seals in moisture and smooths the brush hair! (Think of it as a shampoo/conditioner mix!) It may sound a bit odd to mix the two together but seriously, don’t worry – your brushes will be just as clean and silky as they were when you first purchased them! 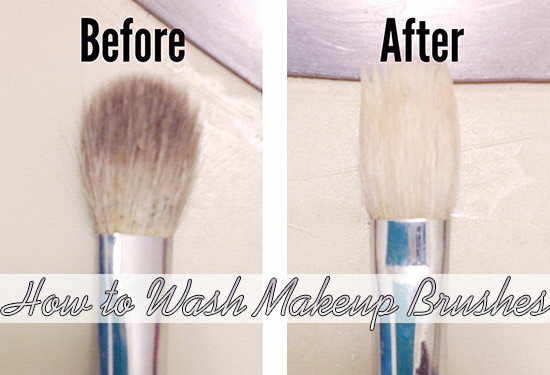 Here’s an easy step-by-step guide as to how you can easily and efficiently clean your dirty makeup brushes. 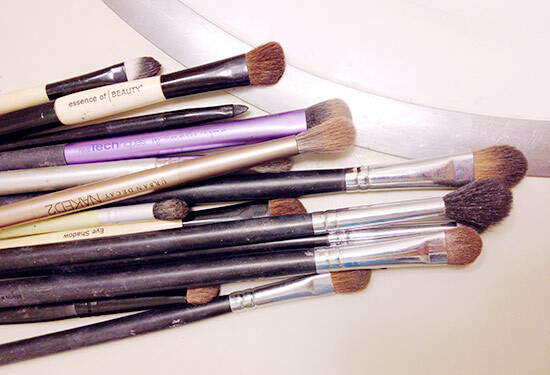 Step 1: Gather all of your brushes that need to be cleaned. 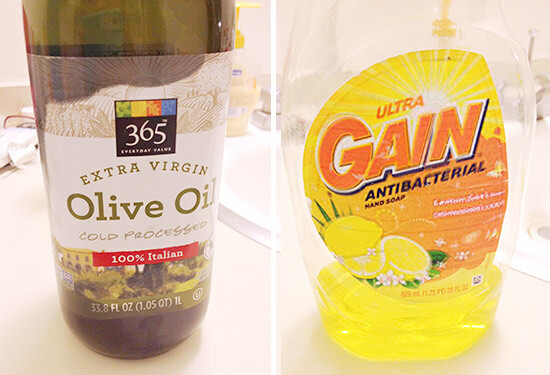 Step 2: Grab your olive oil and your dish soap. Step 3: Mix the olive oil and soap in a bowl. Swirl a brush in the soapy concoction. Step 5: Repeat the process with each brush, pat dry with a clean towel, then leave your brushes out on a towel to dry overnight! And you’re all done! Yes, it’s that easy. This soapy, olive oil-y mixture works really well to clean any kind of brush from any makeup brand! 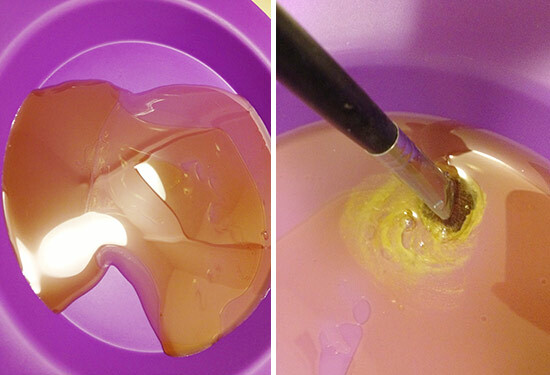 I wash all of my brushes this way, it doesn’t matter if it’s a face or eye brush – it cleans them all! It also doesn’t matter where you purchased the brush- I use this mixture to clean all of my brushes, from Mac to Sigma to ELF. 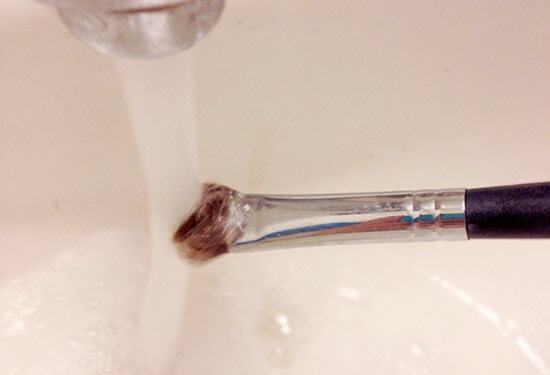 Also, using this method, your brushes will not get misshapen or lose bristles! As your brushes dry, they will take their original shape- not the semi-deformed one that they temporarily have due to their wet bristles. And as long as you rinse your brushes really well under cold water and pat the handle dry before setting it down to dry, the bristles will not fall out! I hope this was helpful- I know I was thrilled to find out that I could effectively clean my brushes without having to spend too much money! 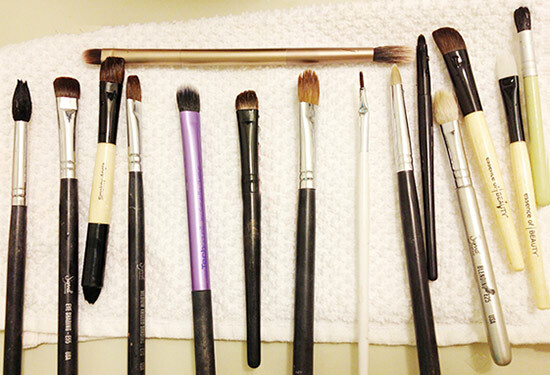 Do you have a different technique as to how you clean your brushes? Let me know in the comments! Next Sponsored: Reminder to Take the CLEAR 7-Day Challenge!